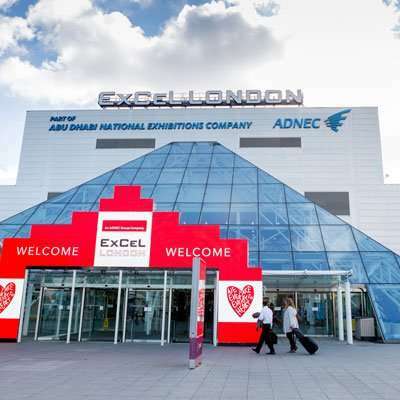 This week, ExCel London played host to the 2018 London Vet Show. 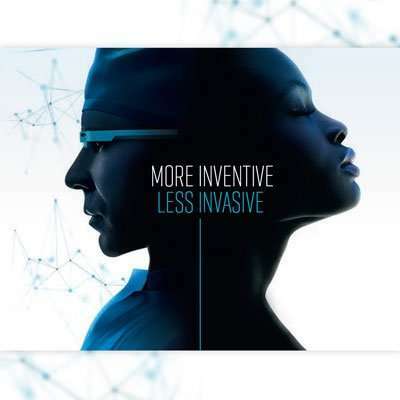 Acteon is a client well-versed in exhibiting at the biggest annual dentistry shows, but some of their scanning and precision surgical products are as suitable for veterinary procedures as they are for human ones. 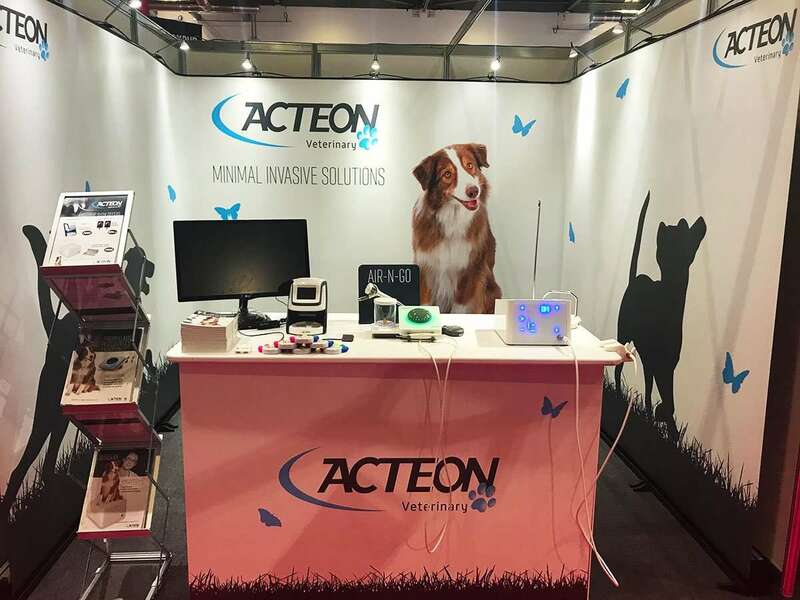 So at the Vet Show, Acteon were demonstrating their PiezoTome Cube, a minimally invasive surgical tool that we recently encountered and described in a post about showcasing product because of the engaging and fun way Acteon were able to encourage interaction with their stand visitors. 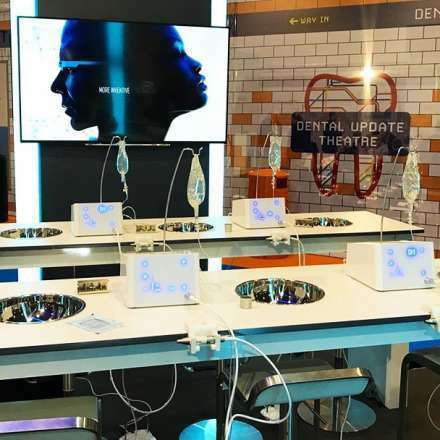 This show may be a highly prestigious gathering for those in the veterinary trades, but for Acteon, it represents a lesser priority than the big dentistry shows. That’s not to say they were merely dipping their toes in the veterinary water, but in a world of competing interests and investment opportunities, they decided to opt for a less imposing exhibition stand than their normal custom build projects. This is eminently sensible; marketing budgets need to be spent, spread and sometimes reserved with corporate priorities in mind. 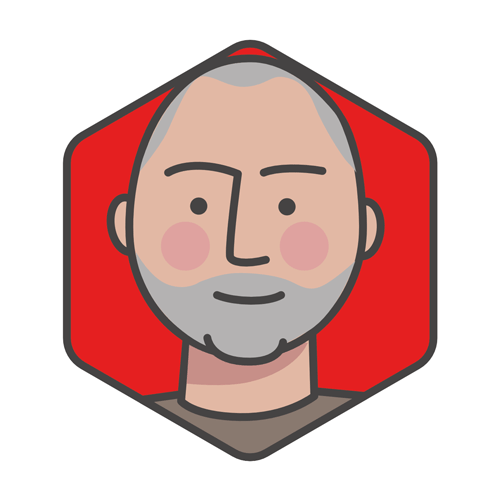 Also, of course, if you have something quite specific to say and don’t need a huge space in which to best say it, a huge stand could look ‘over the top’ and would be less likely to produce a good return on investment. The end result at this show was a more modest space for Acteon’s display. In fact, they chose a 3x3m shell scheme space. Shell schemes were an attempt to bring conformity to exhibition halls in the same way that containerisation revolutionised sea freight, trucking and dock systems. The idea was that a pre-made structural framework would be easier to dress with fabric covers, graphic boards and so on if the size, shape and fixtures were known in advance. Its uniformity would facilitate better reusability of these dressings at different venues. And because the hardware structure was already in place, exhibitors would often avoid the cost of hiring an installer. Shell schemes provide seclusion and clear boundaries (not always a good thing, if you think about it), but for those exhibitors wishing to have their own bespoke enclosed ‘room’ within the exhibition hall, it has always provided a fairly low-cost option for this. 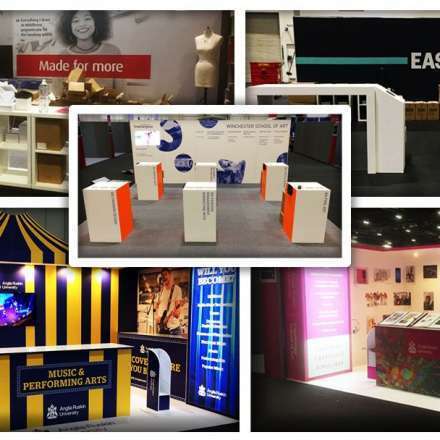 The advent of portable display systems with a relatively small footprint (like our own Twist) provided a solution for those wishing to be able to quickly and easily dress a shell scheme AND also have a free-standing version of the display for other shows. That’s because Twist graphic panels join seamlessly together using a system of magnetic strips, meaning a single large graphic scheme can run the full length of the display as a back-wall. Trying to dress a shell scheme with the vast majority of roller banner systems would create a rather odd-looking structure – a solid back-wall with several disparate banners roughly square in front of it. They may or may not be lined up with each other and they will have gaps between them. 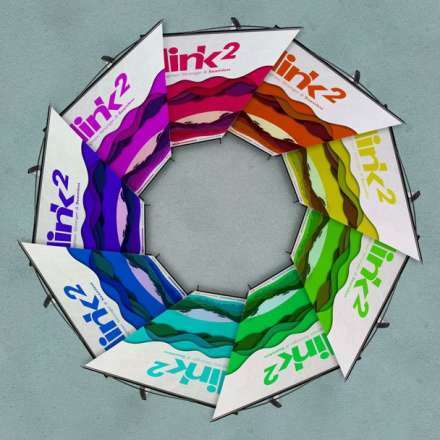 Link2 solves the first of these problems by being linkable in the same way as Twist – with magnetic strips joining each of the graphic panels. Its base cartridge units are carefully designed to facilitate this and will sit happily alongside each other. The cartridges also have a small footprint, so can be backed up much closer to the shell scheme wall behind them. The final effect is of a single seamless back-wall that fits snugly into the shell scheme structure without encroaching into the valuable display space. If lit correctly, this does not need to be a dark and gloomy room either. Link2’s integrated down-lighters can take care of this with aplomb. Electrics can be neatly hidden in the cavity between the shell scheme wall and the Link2 back-wall. 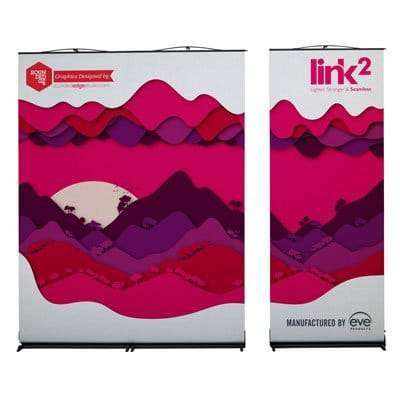 And let’s not forget that because Link2 is a roller banner system, it can be erected, collapsed, transported and stored with great ease and efficiency. We recently described the system as the king of DIY display, and it certainly suits a wide variety of self-build exhibition contexts. The furniture needed for such a shell scheme space will obviously vary from show to show depending on the aims and purpose of the exhibition stand. 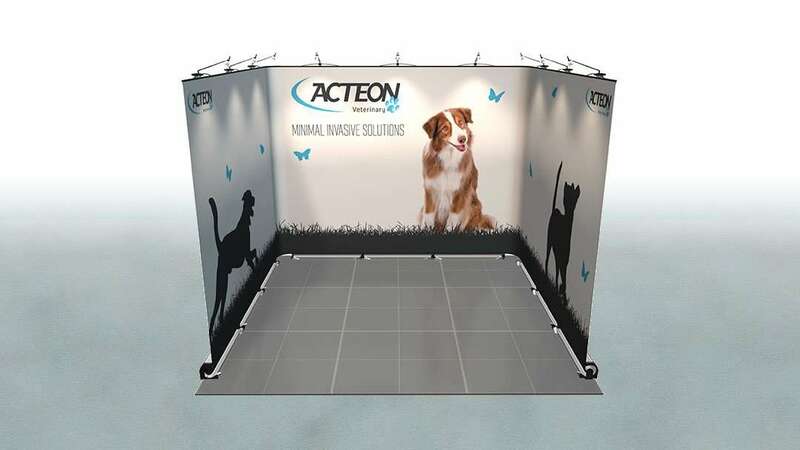 Acteon here went for a large custom counter to become their stand’s fulcrum for meeting and greeting, highlighting and demonstrating products and holding a TV monitor for media presentations. For their handouts, they used a literature stand. The overall effect was a sort of shop-counter, acknowledging that the emphasis here was on discussion and demonstration, but visitors were not necessarily required to enter the space themselves. As a result, their Link2 graphic panel design didn’t need to contain reams of information, leaving them free to use a simple, aesthetically attractive design. 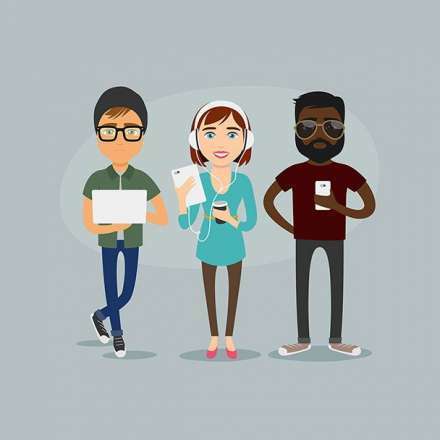 Providing exhibition logistics for GSK at graduate careers fairs this season prompted a rather tongue-in-cheek look at the millennial students attending their shiny new stand. We can’t remember ever building 5 stands at 1 show before! Here’s an insight into the logistics and resource implications when organising multiple installs.